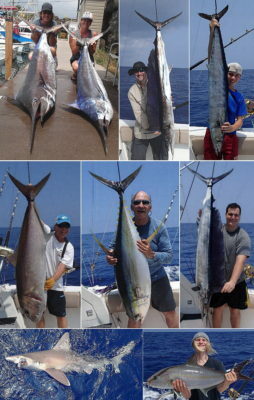 Kona Hawaii Fishing Report – June wrap-up. Tourism is starting to pick up now that the lava flows on the other side of the island aren’t making headline news. It was down about 50% last month. That means more fishing boats out and more fish caught. The marlin bite has been pretty hot but the size has been on the small side. Summer is the peak breeding season. The male marlin are under 200 lbs. and it’s the females that are the big ones. I’ve seen a few big ones this month but there seems to be a lot more males around than females. I’m sure they’ll be showing up soon. There are several tournaments going on all summer long so of course everyone is hoping for that monster marlin for the win. 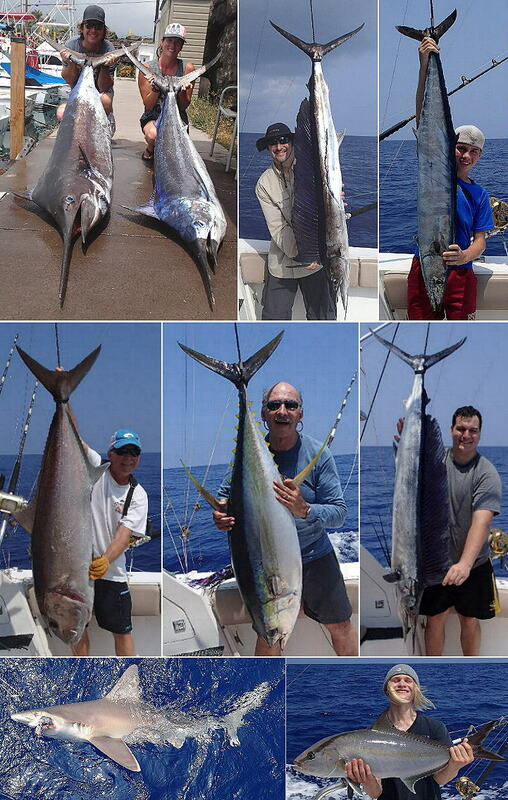 Coming up on July 4th is the World Cup Marlin tournament. With the way things are right now, it doesn’t look like Kona has a chance unless some big girls start moving in. The spearfish bite has been hot too and I catch most of mine on a small lure that I make and run on fairly light stand-up tackle. I also catch a lot of smaller tunas with that lure on almost every trip out. I mentioned in last months report that I got a big ahi on that lure and it happened again this month. It took 2 anglers to get it in the boat and both guys were totally wiped out after the fight. Over the years I’ve been using it I’ve also landed several mahi mahi, some ono and even some marlin but usually, the ono bite it off and the marlin break it off. I’m actually kind of surprised that it held up on those big ahi. Speaking of ono, the bite on those has been pretty good so far this summer. Last year the ono run was a bust! We will have to wait and see if they stay here all summer like they’re suppose to. The bottom bite has been good but high winds out of the North have been keeping me off of the bottom fishing grounds on many of my trips. On trips when the wind is lighter, not just the bottom bite is good but the top water bite has been good also. The high North winds also keep the volcano smoke away from North Kona so it’s a “catch 22”. I like seeing the blue skies and you can even see Maui when the wind blows the smoke away but the waters are rough. When it’s flat and really fishable up North, it also means that the smoke is heavier and not only can’t you see Maui but from about 5 miles out, sometimes you can’t even see the Big Island. Those are the days when the lava is burning new paths. When the lava is covering previous lava flows, it’s not all that bad. ← Kona Hawaii Fishing Report – May wrap-up.